Festivities for the 4th of July at the Queen Mary with Fireworks Show! 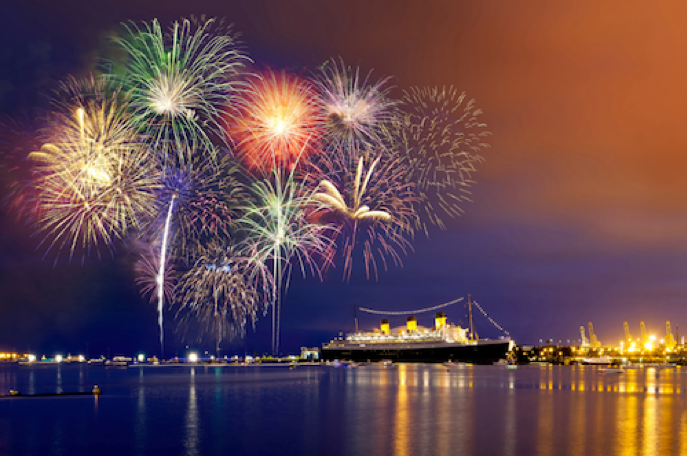 All-American 4th of July Celebration and Fireworks Display at The Queen Mary Tickets on Sale NOW! This years event will have ... Multiple Stages with Live Entertainment, Family-Friendly Activities, Arts & Crafts, a Parade, Food, Strolling Performers and More Throughout the Legendary Ship! Dubbed SoCal’s best display, The Queen Mary’s 15-minute long firework show will take place at 9 p.m. off the stern of the ship in-sync to patriotic, upbeat music. Located in the Port of Long Beach, the Queen Mary features a rich maritime history, authentic Art Deco décor, and stunning views of the Pacific Ocean and Long Beach city skyline. At the time of her maiden voyage in May of 1936, she was considered the grandest ocean liner ever built. The Queen Mary’s signature restaurants include the award-winning Sir Winston’s, Prom Café, and Chelsea Chowder House & Bar as well as a weekly Champagne Sunday Brunch served in the ship’s Grand Salon. History buffs enjoy the ship’s museum and Glory Days tour, the Churchill Exhibit – Their Finest Hours, Ghosts and Legends, and the ship is currently featuring the renowned Diana: Legacy of a Princess exhibit and Titanic in Photos Exhibit. The Queen Mary features event space in 14 remarkable Art Deco salons and award winning staff to create innovative banquets for groups ranging from 10 to 5,000. The Queen Mary boasts 346 staterooms including nine full suites. For more information or for reservations, see www.queenmary.com or call (800) 437-2934. The Queen Mary is located at 1126 Queens Highway in Long Beach.